Is the hard floor the best choice for your office? Have you ever spilled coffee on your clothes? Pretty annoying, I know. But you know how good it can stain different fabrics. If you hate it you can always call a cleaning company to take care of your problem. If not, bear with me. What if I told you that this isn’t a bad thing and you can use it for your advantage. Dye your curtains using coffee. Not only is it non-toxic and completely safe but you will save tons of money. It gives a rich vibrant color and the process is permanent. The key to dying something with coffee is to let it set and let the curtains dry completely before you hang them again. And by drying I mean let them air-dry since most curtain fabrics are not suitable for machine-washing. Brew a large pot of coffee – as strong as you usually drink it. Grab the plastic tub and fill it within a few inches of the top with warm water. Then add 1 cup of vinegar. After that add the brewed coffee to the water and vinegar mixture and stir with a spoon. Remove any metal hardware from the curtains (it can stain or rust the fabric). 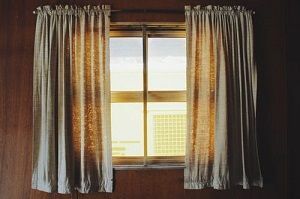 If your curtains’ metal parts are not removable cover them with a thin layer of the petroleum jelly. I would recommend applying it with your finger. After doing that, hold the curtains over the coffee mixture and dip them slowly into the plastic big. You can use the spoon to push the curtain folds underneath the liquid and soak them completely. Leave them for five minutes. When you lift them check the color. If you don’t like it and it’s too light soak them for another five minutes. If you are happy with the result proceed to rinse them. Rinse them only in cool water (in a sink or in a bathtub). That way you will get rid of any excess coffee. Squeeze the water out and hang the curtains somewhere where they can air-dry – for example over a shower rod or on a clothesline. You can proceed with hanging them again. And there you go, affordable and easy. Previous Previous post: Is the hard floor the best choice for your office?